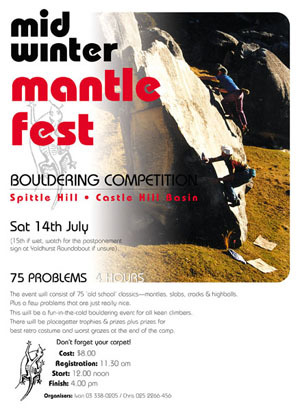 There are four outdoor bouldering compitions a year in the Basin. Each event has its own theme and focus. Run in Spittle Hill, this comp features oldschool climbs - slabs, cracks and mantles. There is a retro clothing theme and prizes for the best retro costume and worst graze. There are 75 problems at one point each and 4 hours to climb them. The endurance event. Held in the maze of Flock Hill with 150 problems (maybe more next time) and 6 hours of running and climbing. 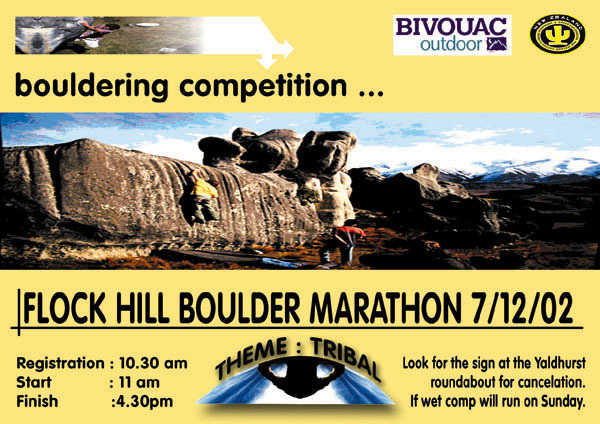 The event starts from the carpark so you must run up the hill to the boulders carring your gear then start climbing. Part of the National Boulder Series. Your top ten problems in 6 hours. Usualy in Quantum Field with a choice of 1500 proplems but was in Flock Hill this year on all newly developed climbs. Dry Valley, bring a suit. 80 or so problems and 1 point each.